Smart grids are expected to introduce increased system complexity due to multiplicity of interacting agents that operate as independent decision makers with autonomous behaviours, goals and attitudes, under constantly changing environmental conditions and power exchange. The JRC, taking stock of the work conducted by Politecnico di Torino (Prof. E. Bompard and B. Han), is developing an agent based simulation platform with several interacting layers (including the physical layer of the distribution grid and the social layer of the prosumers). Additional activities on this front are also being carried out in cooperation with Technical University of Delft and other international partners. The players in the emerging smart grids may be grouped into two categories: macro and micro-players, characterised by different utilities (objectives) based on which they perform decision making. Micro-players are represented by the individual electricity prosumers - i.e. actors that can be at the same time consumers withdrawing power and producers injecting power into the distribution systems - while macro-players, like the Distribution System Operators (DSO), the Transmission System Operators (TSO), the Retailers, and the Regulators provide price signals and technical constraints to the micro-players. The behaviour of each prosumer can be characterised with: 1) attitude toward economic benefit, in terms of avoiding cost from consumption or maximizing earning from power injection (economic dimension); 2) attitude toward comfort, in terms of desire or willingness to use appliances and devices to satisfy his/her living standards (physiological/social dimension). The utility a prosumer can get from electricity consumption/generation can be quantified in terms of economic benefit and comfort and depends on their individual attitude that determines the power injected/withdrawn. Not necessarily prosumers would be striving for the global welfare of the system. Non-cooperative prosumers could be driven by their own utilities and influenced by their social environment. In this respect, efficient market based operation and control are needed for emerging distribution systems with large population of autonomous self-interested prosumers to obtain somehow coordinated participant behaviors and optimized global performance. 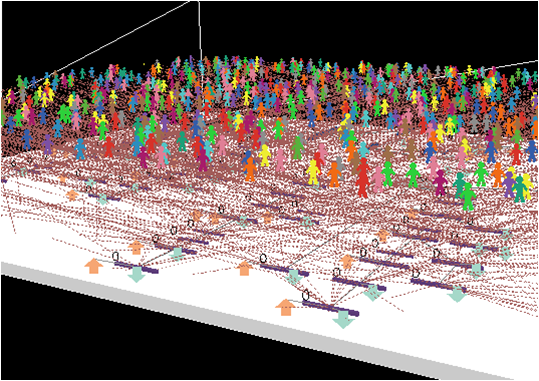 To illustrate conceptually a market based control strategy of prosumers, we considered an agent based simulation platform with two interacting layers: the physical layer of the distribution grid (prosumers connected spatially to the same node of the grid) and the social layer of the prosumers (prosumers marked with the same color). In this case the macro-player is the DSO that, we assume, is able to fix the network charges, assuming a given set of objectives and considering the prosumers' behavior under a market based approach. The results of network performance in terms of network loss are compared with alternative pricing schemes for network charges. Final electricity prices to prosumers are directly provided by retailers, and this final price usually contains also components charged by DSO and TSO for connection and network usage. For testing market based control strategy, we chose, as a simple example, the network charges paid to the DSO for the usage of the distribution network, as the control signals, and we considered the DSO as the only macro-player to execute market-based control to optimise the distribution network performance in terms of network losses, considering the constraints on voltage profile and line power flows. Different society may present different prosumer dynamic behaviors in term of the convergence to a small number of typical behaviors. In the aforementioned simulation, we considered a society with the highest degree of convergence. In emerging electricity distribution systems the overall system performance is related to the interplay of macro-players (Regulator, DSOs, Retailers) and micro-players such as prosumers with different global or individual goals and utilities. The global utilities pursued by the macro-player in terms of environmental control, energetic efficiency or technical feasibility of the network can be pursued providing proper price signals to the micro-players and devising strategies that would align the global goals with the individual utilities. To choose a proper regulatory strategy, comprehensive models of emerging distribution systems able to incorporate both social and technical layers are needed and can be used to test ex-ante the strategies. Managing self-interested distributed decision makers by simultaneously optimizing multiple objectives in terms of network and market performance seems a promising way to capture the dynamics of complex smart energy systems. The JRC is expanding its activities on agent-based modelling, in cooperation with Technical University of Delft, Politecnico di Torino and other international partners. Real data sets are expected to be used to improve the models and validate the results.